You may be familiar with the Dionicess series by now, or perhaps not. Whatever the case, it’s time to get (re-)acquainted for the tenth installment of pairing sessions, because the boys are about to bring you an extravaganza of aged beers and foods for your enjoyment. 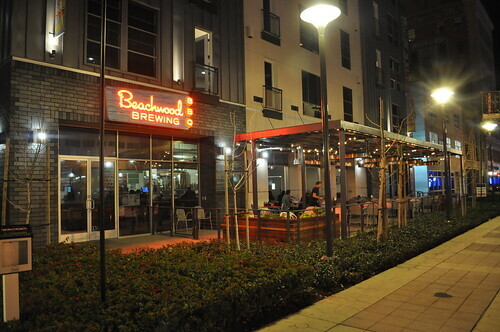 Yes, you’ll have to venture to Long Beach for this special event, but let’s be honest: There’s really no better reason to do so than Beachwood BBQ. At an all-inclusive $80 with 5 pairings and the proceeds going to Real Medicine Foundation, you know this particular summer Sunday will be more than worth it. The base beer by Julian of Beachwood BBQ is high-gravity and contains Green Cardamom and was fermented with a bunch of Blackstrap Molasses. Jeff Duggan of Portola Coffee Lab was given a sample of this base beer in order to craft a coffee that would lend the beer an “Armenian coffee” note. These beans were then placed in the beer a few days ago. Soon, oak chips that have been soaked in 25-year-old Armenia Cognac will be used to age the beer in time for the event. And the resulting product, dubbed “System of a Stout,” will be an exclusive to Dionicess X for the series’ tenth anniversary and for your tasting pleasure. 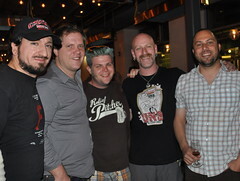 You’ll have Gev Kazanchyan, a public health professor; Randy Clemens of Sriracha Cookbook fame; Dave Watrous, “The Guezehound” of Beachwood BBQ; Gabe Gordon, Executive Chef of Beachwood and Julian Shrago, Brewmaster of Beachwood to guide the way. Because you’d expect nothing short of the experts to impart knowledge and tastes to your palate, now wouldn’t you? Basically, everything you’ll be enjoying on this evening will have undergone an aging process of some sort – whether beer or food. And there will be a couple goodies to take home with you, such as a specially-bottled, limited edition Bourbon Barrel Aged Chile Sauce. Talk about swag. Tickets are almost sold out, so it’d be a good idea not to sleep on this one and reserve your seats now… I’ll see you there. This entry was posted in beer, Food, L.A., Long Beach, Pairings and tagged Beachwood BBQ, beer, Dave Watrous, Food, Gabe Gordon, Gev Kazanchyan, Julian Shrago, Long Beach, pairings, Portola Coffee, Randy Clemens, Real Medicine Foundation. Bookmark the permalink.